Cofer Brothers stocks engineered lumber products from Weyerhaeuser and Trimjoist. Both are top quality and environmentally sound products that are easy to install, giving you a solid floor system in your new home or addition. By using engineered floor products you can have more spacious rooms than ever imagined or possible with conventional framing. Also, in some applications, engineered lumber could be less expensive than conventional framing by creating greater on-center spacing and spans. We have a complete staff with over 30 years combined experience that can create floor design off of your complete house plan. 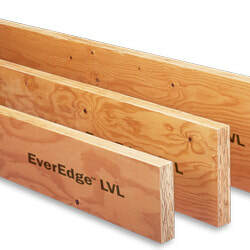 Weyerhaeuser offers a full line of engineered lumber products, including Everedge Series I-Joists, Everedge LVLs, and Weyerhaeuser Rim Board, as well as value-added services to help you build your business. ​9 1/2", 11 7/8", 14", 16", 18", 24"
​20 Series- 9 1/2", 11 7/8", 14"
​Rimboard- 9 1/2", 11 7/8", 14" 16"
TrimJoist is the marriage of an open web floor truss and a trimmable, wooden I-joist, bringing the best features of each to the relationship. As the name TrimJoist indicates, this product can be trimmed on the construction site for a custom fit. No more custom made floor trusses!